Michael Chanover is the Chief Creative Officer at Fingerprint, a mobile start-up that is the first learning and play network for kids and their grown ups. Prior to Fingerprint, Michael was VP of Product for the Alsop-Louie portfolio company, Kidlandia. 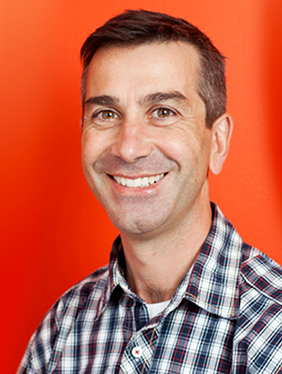 Prior to Kidlandia, he was Global Creative Director of Web & Brand at the educational toy company, LeapFrog Enterprises, where he directed products and programs that converge user experience, brand, strategy, Web, and print technologies. Before that, he spent four years in the San Francisco and New York offices of frogdesign, as Executive Producer and General Manager. In addition, Michael was the recipient of the UNESCO Design for Rehabilitation Award and has lectured and written on the subject of strategic design. Michael has a BFA in Industrial Design from the Rhode Island School of Design and has held teaching positions at the California College of the Arts and the Academy of Art University in San Francisco. 1. Your first professional position was with Disney Interactive working on CD-ROMs for children. From there you went to frog, which had a much broader mandate. Can you tell us what you did there? Sure thing. I went to frog to lead programs that spanned digital, physical, and brand by working between the internal teams, and the client to help bring these programs to life. It was awesome. I was a bit of a ‘swiss army knife’ in that I did a lot of different things, and I felt very aligned with the culture and philosophy of frog and worked with some truly amazing people there. 2. From frog, where you served many large corporate clients like Nike, Ford and Panasonic, you joined Leapfrog Toys as Art Director, working on interactive paper and screen based product. Why did you make the shift back to children’s products? Were they especially appealing to you? If so, what was it that drew you to them? Yes, it actually was not an interest in kid’s products per se, as it was rather an interest in joining a company that made and manufactured products. Having just spent 4+ years at a studio that consulted, but didn’t actually own the product in the end, I really wanted to see it from the ‘other side’ and get my arms around the process from an in-house perspective. And, LeapFrog was one of the more interesting plays at the time as they too embodied experiences that spanned hardware and software and had just nailed a product/market fit. 3. You stayed at Leapfrog for nine years during which time you advanced to Global Creative Director, Web and Brand. At that point you were “steward” of the Leapfrog brand and seemingly much more involved in marketing than product development. Did this shift appeal to you? How did the work differ from what you had done before? Good question. –It will come as no surprise that I have a very product-centric view of branding and found myself enjoying the blur between product and marketing. I was also a bit surprised by how much I enjoyed marketing and saw many parallels between marketing and product design. Good marketing tells a story, it is based on tapping into a consumer need, it is emotional, and, when executed well, it feels natural. It is also extremely creative. And marketing, like products, are ‘consumed’ by people. So, no, in the end, it actually didn’t differ very much at the core. 4. Your tenure at Leapfrog was followed by two start-ups, Kidlandia and now Fingerprint. It appears that Kidlandia did not succeed. Can you tell us what went wrong with Kidlandia? What did you learn from the experience? Sure; I left LeapFrog specifically to join a start-up. I was excited about Kidlandia as it was an early stage start-up, which meant there was a lot of opportunity to build amazing things. And, build we did! We made an online world, physical products that tied to that online world, and a series of mobile games that also connected to the online world. It was an amazingly ambitious charter and we executed on it. In retrospect, we probably executed on too many things at once, but hindsight is always 20/20 and when you’re in the moment, it is easy to convince yourself that it all has to get done. With that, my big lesson learned was to focus, focus again, and then focus more. All that being said, we know start-ups are high risk, and many do not make it. I went to Kidlandia with eyes wide opened and I’m still proud of what we accomplished. 5. Fingerprint, on the other hand, seems to be growing by leaps (no pun intended) and bounds. Is it simply a better idea than Kidlandia, or is there a “secret sauce” you can share with us? I suppose you could say it is a more timely idea, and a more strategic idea. Yet, really, there is no comparison between the two companies; they’re just two fundamentally different plays. And, no, there is no ‘secret sauce’ per se. Rather, it is the convergence of a lot of things going well and I’m sure a dose of good luck. 6. You have worked with many impressive licenses. What are the pluses and minuses of working with licensed properties? Licenses are great as they are pre-packaged, proven IP that one can then build on. Building IP and building a brand is extremely difficult, time consuming, and expensive. Mind you, it is easy to do a bad job; we see it all the time. It is much harder to build something magical. When you have that magical IP as your starting point, you’re not starting from the ground, and that can be very valuable. The minus is that the IP is clearly not yours and you must work within the constraints of the license. For example, you may have a great concept for an app that has a character break the fourth wall, yet if that is not within the definition of the license, it can’t work..
7. What product or service have you seen lately that really excites you? I’ve been spending a lot of time looking at the video landscape lately and I’m seeing some interesting things happen. The value chain is being disrupted, quickly. HBO just announced their own streaming service, which effectively cuts out the cable companies, Amazon continues to build out their video ecosystem between what they offer Prime users, and there is clearly movement afoot with YouTube and their appetite to reach kids. There are lots of shifts in the landscape. 8. What are you most proud of in terms of career accomplishment? There is really nothing like that feeling you get when you go to a store, and you see someone buy a product that you made. Of course, there are many people involved in the process, but watching someone pick up your box at the store, look at it, and then decide to put in in their shopping cart, is amazing. It makes all the work feel very worthwhile. 9. What is the most surprising result you experienced in your career? For example is there a product that you thought was a sure winner that did not perform as well as you hoped? What did you learn from this experience? I’m often surprised when conducting user research and I realize that some of my assumptions are valid, and others are not. This pretty much always happens, yet it still surprises me. The other way I’d answer it is we have indeed launched apps at Fingerprint that we’ve been confident in and didn’t perform the way we expected and other apps where the opposite is true. Exactly why, we can always speculate, but it definitely supports the “you never know” perspective, and that the most important path forward is to ‘try’. 10. What is the biggest risk you have taken in your career? Did it pay off? How and why or why not? What are some of the things you’ve learned about taking risks? This is a hard one to answer… I’d probably say that it was to leave the world of larger companies and go the entrepreneurial route by joining a start up (and now, another). Yet, I didn’t see that as a big risk, per se. I came to appreciate that things happen at big companies and things happen at small companies. I came appreciate that at a smaller company I (and everyone) can be much more aware, in terms of what is happening. And, most importantly, I realized that I love the agility of smaller teams and that the hands-on nature of a start-up fulfills me. That is the ultimate pay off. 11. We call this blog, Influences and Influencers, who are the people who have influenced you? Have you ever had a mentor? Can you tell us about him or her? Whose work or input has impacted you the most in your career and how? I’ve been lucky to have a few. One was Hartmut Esslinger, the founder of frogdesign. Hartmut saw design through an incredibly strategic lens and truly had a vision around every product that we worked on. He is one of the ‘grandfathers’ of Industrial Design as we know it today and did more to advance the notion of people having an emotional connection with products than I believe he is credited for. He taught me the importance of a narrative in design, and the importance of partnering with your clients such that they share in your vision. Another is Nancy MacIntyre, the CEO / Founder of Fingerprint, where I work today. Nancy can balance ‘creative’ and ‘business’ in a way I’ve never seen before. She can just as easily brainstorm product ideas as she can put a business model or marketing plan together. She has taught me to expect the absolute most out of my team and myself. 12. If an aspiring digital media producer came to you for career advice, what would you tell him/her in terms of building a career? That’s easy… I’d tell them to follow their passion, first and foremost. I’d tell them that all the walls around them are not real, and they can do and be whatever they want. I’d tell them that knowing what drives them is of the utmost importance. On the tactical side, I’d tell them that their ability to talk about their work, to communicate, and to collaborate with others is, ultimately “the job” and to work on mastering those skills. 13. If you could start all over again, what career would you pursue? There is nothing I would do differently. I am very lucky to have parents who were supportive of me and always encouraged me to do what I love, which is exactly what I’ve done. No joke, I feel honored to have had the opportunities I’ve had and I giggle to myself knowing that.